In past we have covered many useful utilities and tools from Comodo, like Comodo Time Machine, Comodo Cloud Scanner and Comodo Verification Engine. Now here is yet another extremely useful utility from Comodo for Windows Users, Comodo Programs Manager. 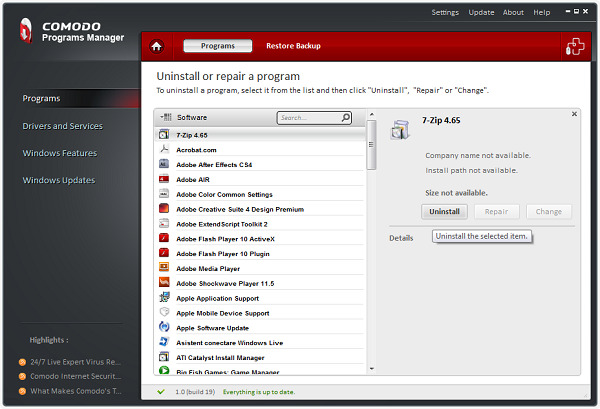 Comodo Programs Manager is a handy, easy to use application designed to help you manage windows features. This tool offers you instant access to add or remove windows components / features. Below is complete features list of Comodo Programs Manager. 1. Streamlined user experience: New graphical interface to streamline your work and improve your efficiency. 3. Remove locked files: Locked files are automatically removed at next Windows restart. 4. Malware info: To ensure that your computer stays safe, every time a setup is started it is also checked for malware using our cloud technology. 5. Update applications: Constantly updated database will keep your computer always up-to-date.